NOAA has just announced that the federal government is discontinuing printing of the traditional lithographic paper charts in April, 2014. The reasons given include echarts are becoming more popular, and (more to the point) the NOAA print on-demand (POD) paper charts have gained wide acceptance. Agents who can sell both types of charts sell some 80% more of the POD charts than the litho charts, in large part because when they get back to the ship the navigators know the charts are up to date. "Federal budget realities" was also mentioned, but this is not a predominantly economic decision, even though traditional litho charts have been heavily subsidized. At the time of writing, this transition is still six months away, so we do not know what options will arise between now and then. But is it clearly a change in a direction that could be expected. Many books are now published in this manner, and the percentage grows steadily. As prices go down and quality goes up, even more books will be printed this way. It also has the virtue, similar to nautical chart printing, that even rarely sold books can now be printed and made available without increased costs, not to mention that each printing is the latest edition or version of the book. Only the master file has to be changed. In contrast, traditional book printing yields warehouses full of books, with or without known errors in them. At present POD charts cost a few dollars more than litho charts (same as in book publishing), but the masters are updated weekly and the charts are readily available. Granted, there are not many authorized sales agents who have the printing capability in house, so we will not have as many places to walk in and buy them, but they can be purchased by mail order or online from authorized agents. Another trend that is not unfamiliar. We have already taken one big hit in outlets when the printing of nautical charts was transferred to the Federal Aviation Administration in 2000. In recent years, the FAA proceeded to close all but the largest chart agents. This will be another step in that direction. But we still have need for conscientious chart agents who provide advice on selections and who might stock samples of the charts for us to view in full form–or they guide users through the excellent online chart viewers at NOS. Then after selection, they either print the chart on the spot (if they have the facilities) or they order online to be shipped either to the store or direct to the customer. Chart selection is an important part of navigation, so we look forward to keeping the agent support we have grown accustomed to. The POD chart process has been long tested, but it can still improve, and it likely will. 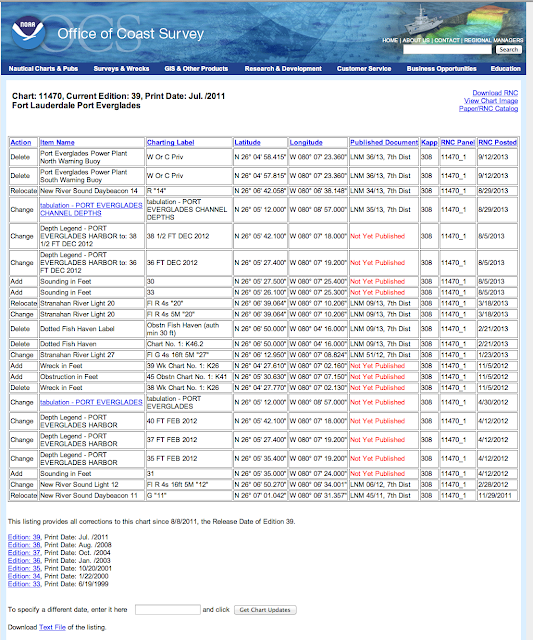 Up until March of 2012, there was only one NOAA-certified print-on demand provider (oceangrafix.com), but now there is also East View Geospatial (geospatial.com), which offers not only updated NOAA charts, but also nautical charts from around the world. These two companies, both based in Minneapolis, MN, have different options and also paper choices. We will have to see how things develop. For now, one sample of an early OceanGraphix POD paper we tested is not as durable as the litho charts. It definitely tears more easily, but it responds to multiple folds in about the same way. Water runs off this POD paper more readily, but it did not respond well after being wet for a long time. Traditional litho charts, on the other hand, can be soaked in saltwater and wadded up, then dried out and ironed, and they look remarkably good. Neither type of chart likes to be rubbed when it is wet, but this sample POD chart liked it a lot less. You can easily make smears that obscure the printing. If they get wet they should be carefully patted dry and then let dry thoroughly. The main difference we detect is how they erase. If anything, they take pencil lines even better than the litho charts, but they do not erase well at all. Normally we recommend not erasing past routes as you might go there again and benefit from your past tracks, but we all make mistakes in plotting, and these mistakes are very difficult to remove on a POD chart. Again, I refer to the present paper in use by just one company. Once POD is the only option, we expect the technology will improve. Or maybe someone will invent a special pencil for writing and plotting on POD nautical charts. East View Geospatial has 4 paper options, and we will test these with a follow up report as soon as possible. The UK and Canada also offer POD charts, and I understand they have also been well received, and may use a different type of paper. If you have not used one of these charts in the past, you might find it valuable to buy your next chart in that format to see where we are headed. Maybe try a sample from each outlet. If you really want a set of the latest and last litho charts for your region, you may want to buy them now. There is a chance they have already stopped printing some charts and are relying on existing stock, knowing there is no new edition on the horizon. You can stay informed on the chart news by monitoring the excellent nauticalcharts.noaa.gov website or follow @nauticalcharts. 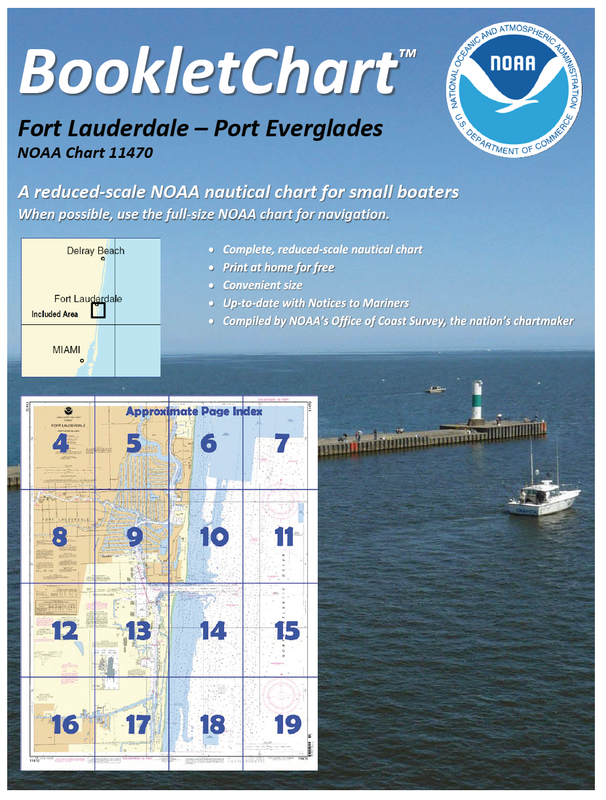 From a practical point of view for many mariners, paper charts are a back-up to echarts. And it won’t be long until the back-up to an electronic charting system (ECS) is second ECS. NOAA has already begun producing free tablet apps to read their echarts, as well as the GPS and display relevant Coast Pilot data at places of interest. There are numerous commercial ECS apps that do this as well. Nevertheless, mariners are rightfully conservative and do not want to be 100% dependent on electronics, so some form of printed chart will be with us for a long time, and with other new changes at NOAA we have related options. 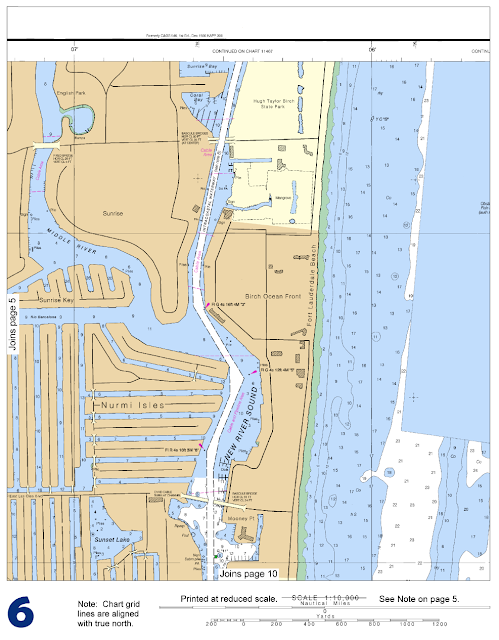 NOAA now offers free high-res pdf files of the full nautical charts. It is a brand new system and we have to see where this goes as well. But now we have options of our own. In principle we could print our own charts, but large size color printing is very expensive (about $7.25/sq. ft. or about $80 for a 3 ft. x 4 ft. chart). In lieu of a full chart, we can crop a pdf and just print the part we need. In some cases for local sailing you might need just one corner of the chart. Or print the chart on 11 x 17” paper in sections, and make a booklet. If you do want the full chart in printable pieces, NOAA has had this option already for several years, though now these are updated automatically, just as the POD charts are. They are called BookletCharts. These are very nice products, and you can print them on letter size or tabloid size (11 x 17) paper and have a nice set of chartlets. On the other hand, if we are thinking of back-ups, then we could use a gray-scale print, and these are more like 75¢ per sq. ft.. A gray-scale chart would be about $9, much less than they are now in color (about $20). This would not be a good choice for routine navigation, because so much information is in the color, but it would serve as a back-up. Once we do print our own charts, or buy some that we do not want to replace with every new edition then we should look into the process of updating the charts ourselves. Recreational vessels have this option, but some commercial vessels are required to carry the latest edition, and needless to say we recommend using the latest editions or updating if not. This is an easy process. The corrections are all online, and well organized by chart number–and by chart edition, if you have to go back several editions. There is also an option to print out a text list of the corrections that you can take with you if you don’t get to the updates before departure. Normally it takes just a few minutes to update a chart from one edition to the next, which is a big savings, and a worthwhile exercise. The more you get involved with the charts you use, the better off you will be when you need them. The changes listed in the above link are all those made since the last edition. They are incorporated online weekly into the latest pdf or POD chart; they just do not appear on older editions. The changes listed are called critical changes, which relate to safe navigation. New editions, when offered, will also include the accumulated non-critical changes, such as newly surveyed shoreline boundaries in non critical areas, new structures on the land, soundings in non critical areas, or maybe slight compass rose adjustments, and so on. We have just added this new section to our training materials, which we post here for feedback and comments. Earlier sections of the text addressed compass checks by simply swinging ship promptly and watching that the shadow bearing does not change. Here we expand the use of the sun with a more versatile and accurate method. The sun method just described uses several approximations and also calls for changing course to make the checks. Often we are underway and just need to be sure the compass is right on our present heading, and then we will worry about other headings when we can. This comes up, for example, in an ocean yacht race, where some doubt about the steering compass might arise because the electronic heading sensors are reporting other headings; in a race you do not want to stop and swing the ship. But we do not have to. Here is a quick and easy solution that you can use in the ocean or in your local lake. We are relying now on celestial navigation in a sense, but we do not need any of the details if we are on land and have access to the Internet. We just assume if you are in the ocean, you have the full tools to solve this with conventional cel nav methods. 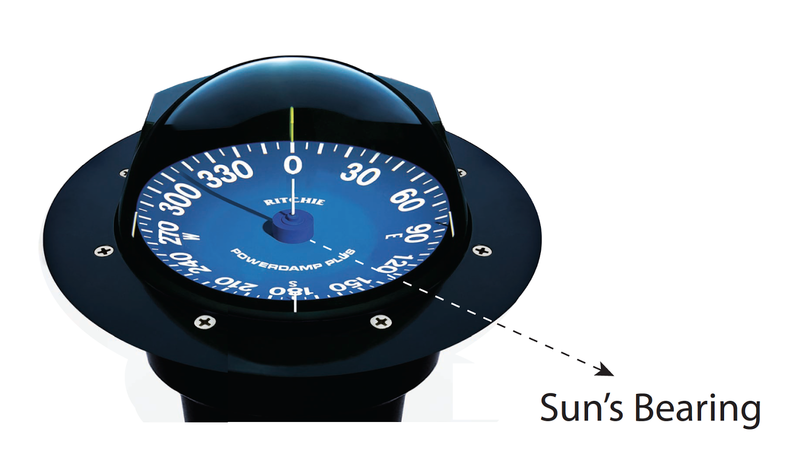 We start with the measurement of Figure 12.9-1 where we learned that the compass bearing to the sun was 135 C when the vessel was headed 000 C. Note that this heading does not matter for this application. We just happen to have a nice picture with the compass in that direction. For this method, you measure the sun bearing on whatever heading you happen to be on. Figure 12.9-1. Reading the sun’s bearing form the reciprocal of the shadow pin bearing. Here the shadow is at 315 C, so the sun’s bearing at the moment is 135 C, when the vessel was headed 000 C. From convenient resources on line we can determine the true bearing of the sun at this time, and from this and the known variation for our location we compute the magnetic bearing of the sun. The difference is then the deviation of the compass on our present heading. But we do now need more information. We need to know the time accurate to within a minute or so, and we need to know our location. Both you can get from the GPS. Now we need to look up or compute what the true bearing of the sun was at this moment based on cel nav principles, or we just go online and look it up. Go the starpath.com/usno for a quick link to the right place at the US Naval Observatory. Then type in the time of the bearing and your Lat-Lon. As example is in Figure 12.9-2, which assumes we were headed north in Chesapeake Bay on Oct 14, 2013, and we recorded the bearing at 0930 EDT, which is 1330 UTC. The true bearing to the sun at the time was 123.5º. Next we need the local magnetic variation which we could get from a chart, but for this type of precise compass check we might want to go back online and get the most accurate and up to date value. 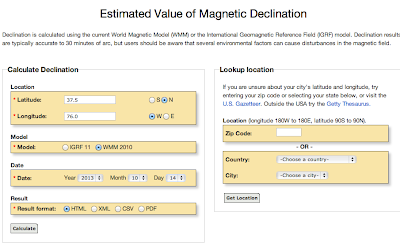 This you find at the National Geodetic Center (ngdc.noaa.gov/geomag/geomag.shtml) for specific times and locations. 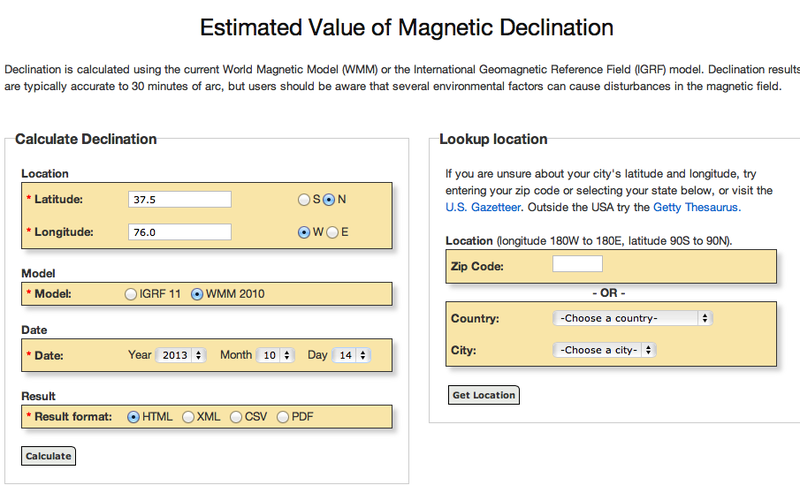 For our example time and location the correct value is 11º 05.3’ W, or about 11.1º W.
Input screen for online GeoMag. Note you can download a Windows version of GeoMag for your own computer if you like. It makes a nice backup underway. Note too, land navigators call variation "declination," but this is never done in marine navigation, because we have other meanings for that name in marine navigation. So the proper magnetic bearing of the sun is 123.5 + 11.1 = 134.6 M. The compass showed 135 C, so the deviation on heading 000 C is -0.4º which would be called 0.4º W.
We have learned that this compass is essentially correct at this heading, as it is difficult to be confident we have read the shadow bearing to this precision. But the main point is, this method has no other approximations in it. The result you get is as accurate as you can read the shadow bearing on the compass card. This is a very powerful method. It would be instructive to try it once or twice whenever you see a nice shadow on your compass card, no matter where you are. Just write down the shadow bearing, the time, and the location, and your actual compass heading at the time. Then you can check the compass for that heading when you get back home. 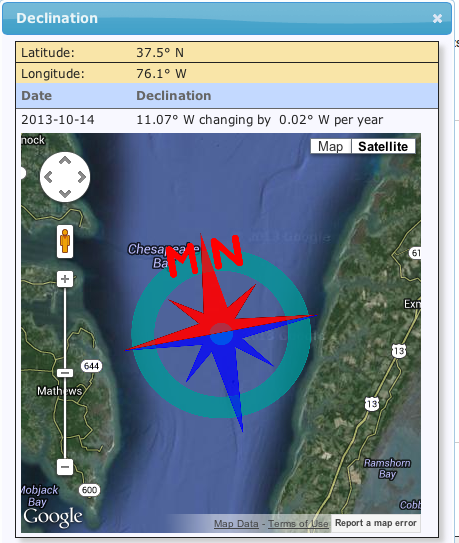 If convenient, record the data headed roughly north or south by compass and also roughly east or west by compass, and then you will have a pretty good analysis of your compass with a few minutes of paperwork at home. Many electronic electronic barometers offer the option to display sea level pressure, which they compute from the measured station pressure corrected for the elevation of the instrument above sea level. The only user input to this type of conversion is the elevation of the instrument. In barometry terms, station pressure is called QFE, and sea level pressure corrected for elevation alone is called QNH – it is called the altimeter pressure in aviation. In the true atmosphere, however, the equivalent sea level pressure measured at a location that is well above sea level is more complex than a simple elevation correction can account for. The more realistic value of sea level pressure, called QFF, is a bit of a tricky concept, in that we wish to know what the pressure would be at sea level measured from the top of a mountain, as if the mountain were not really there. QFF is the pressure needed by the National Weather Service so they can make maps of the sea level isobars that spread across a landscape that varies in elevation from place to place. The measured pressures across this landscape are crucial to seeding the numerical weather prediction models that in turn are used to forecast the weather over the region. Since pressure is the weight of the atmosphere above us, and because cold air weighs more then warm air, we can see that air temperature must be a factor in this correction as well as the elevation. 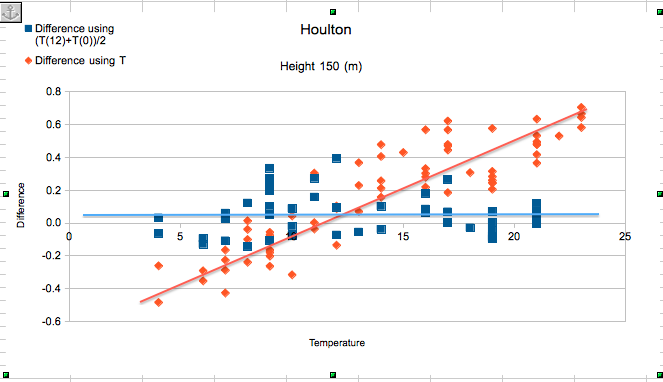 The simple conversions that use only elevation are based on the International Standard Atmosphere, which provides a specific formula for how pressure drops with elevation. It also assumes that the temperature of the air is also following along with that of a standard atmosphere, namely starting at 15º C and dropping at a rate of 0.0065º C per meter. This turns out to be a reasonable approximation, provided the air temperature at the elevation at which you measure the pressure is about what it would be in the standard atmosphere for that elevation. Thus if I am at 300 m elevation (984 ft) the correction to my station pressure reading (QFE) to get to QNH would be + 35.5 mb, based on elevation alone. But this correction assumes the outside air temperature where I am is 15º - 0.0065º x 300 = 13.1º C (55.5º F). 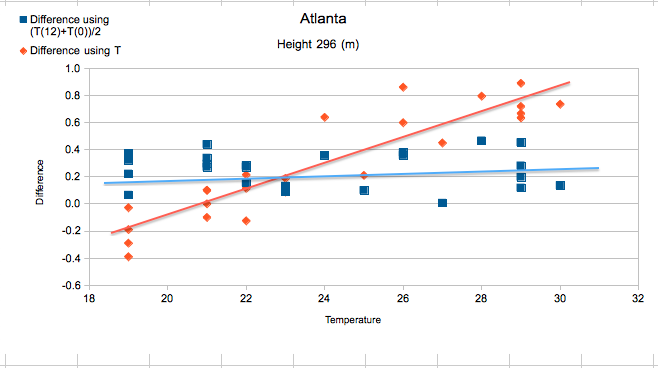 Needless to say, all locations in the world that are at 984 ft elevation are not at 55.5º F at all times. The first ever insights into this issue can be traced to the American meteorologist William Ferrel in a paper from the mid 1800s. He worked at the US Signal Corps at the time (forerunner of the NWS), and his pioneering paper on this subject appeared in the same report that included a paper on the interpretation of smoke signals used by the Apache Chief Geronimo. 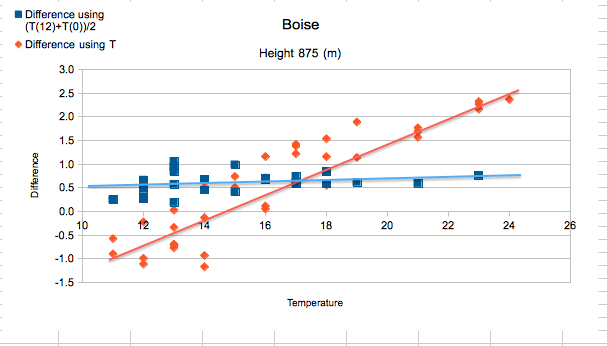 Ferrel pointed out that there had to be temperature corrections applied because the average daily temperature range, as well as the average annual temperature range, are notably higher on elevated land than they are at an equivalent elevation in the air, away from the land. The required corrections for temperature can be notable for elevations above 1000 ft, even at modest temperature ranges. Notable in the sense of the rate that pressure changes across a typical weather pattern, which is depicted on weather maps with isobars spaced 4-mb apart. Thus a 1-mb discrepancy could shift an isobar by many hundreds of miles in some cases. 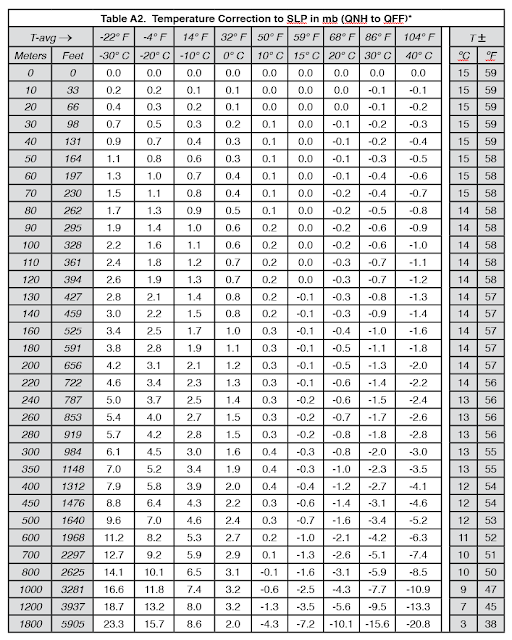 Table A2 below shows a list of air temperature corrections based on a simple hydrostatic equation, which accounts only for a difference in air temperature. 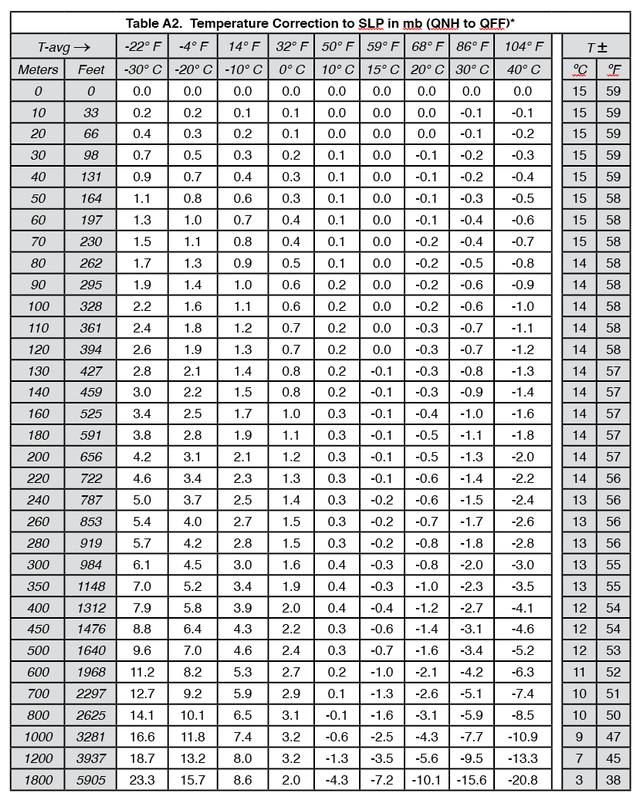 The far right column shows the expected air temperature based on the ISA as a function of elevation. At these air temperatures, the temperature correction as we present it here would be zero. As an example, If the barometer is set to report SLP using an elevation of 200 m (656 ft) and it reads 1022.8 mb when the average outside air temperature was 30º C (86º F), then the pressure should be corrected by -1.3 mb to read 1021.5 for comparison to weather map reports for the same time and location. Likewise in the winter, when the same pressure was measured in outside air temperature averaging 32º F, then the correction would be +1.2 mb for a QFF of 1024.0. This 12-hr time average is not an obvious choice. It is also not the result of a mathematical theory, but we can expect that some average is called for. We know the virtual temperature of this virtual air column affects the pressure, and it is reasonable to assume that the the pressure at the base of this column cannot respond instantly to a change in temperature at the top, so we are led to averaging over some time period to reach equilibrium. In other words, the air temperature at the moment is not what we should use to project this pressure down to the sea level, but rather some average of what it has been in the recent past. Ferrel originally tried a 24-hr average, but found that was too long. The daily changes in air temperature with the rising and setting of the sun distorted the underlying weather pattern pressures. He found that a 12-hour average was the best compromise in that it provided the most systematic results when compared with data from neighboring locations. Recall the main goal of this endeavor is to develop a systematic measure of the sea level pressure pattern that is as independent of local terrain as possible. And he was pretty much right. Ferrel's approach to air temperature has not improved much over the intervening 150 years! Since this air temperature averaging seems at first a rather arbitrary procedure, we have looked into this in more detail. 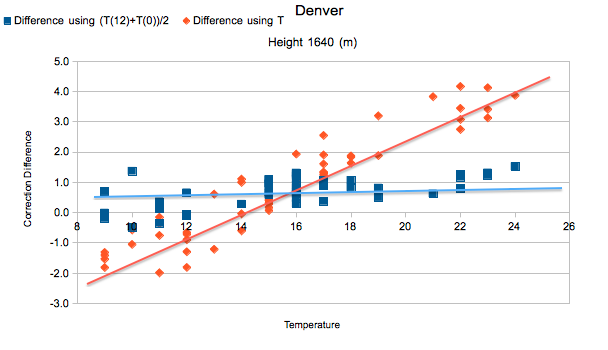 One way to test Table A2 using present air temp versus using the 12-hr average air temp is to compare the corrections we get with those generated by the AWOS (automated weather observing system) computers located at airports around the country. These computer programs use the most sophisticated analysis available to convert QNH to QFF. They use the latest models for virtual temperature as well as the humidity and even local fudge factors developed over the years, stemming from what Ferrel originally called Plateau Corrections. The AWOS generate METARS (a long French phrase meaning airport weather), that include both QNH and QFF along with the air temperature, dew point and other data of interest to aviators. A typical METAR looks like the following. The top line is the METAR code, below it is the translation of the code. The one below was just pulled offline at this writing, along with one from 12h earlier. Elevation at KABQ = 1619 metres (5312 feet). The only information used from the bottom METAR is the air temperature. 1252 on the 11th is 12h earlier than 0052 on the 12th. So we want to compare the correction for T(0h) = 14.3 with the correction we would get for T(avg) = [14.3 + 3.9)/2] = 9.1. There is an interpolator at www.starpath.com/calc (sample below), and the free Windows program Celestial Tools by Stan Klein includes such a function, among others valuable to the navigator. So we see here one data point: the best AWOS correction was -3.3, and we got -5.8 with present air temp, but got -2.9 with the average air temp. Still not exactly right, but a huge improvement from the average – it might even have been closer with a computation rather than interpolation. That example shows the approach we are taking to study this effect. But not just one case like this but very many. With high and low elevations, hot and cold temperatures. This example, by the way, is a very high station, and we still got pretty close. Below 2000 ft the table using the right temperature is very good. Below are a few selected samples of data so far that support very clearly the need for the average temperature and not the current temperature. They are comparisons done just like the one above but for multiple test cases for different locations. Needless to say, these are all typical, we have not selected out particular sets, nor omitted any data points, and we have many more examples that behave the same way. The red lines represent the errors in our corrections using T, and the blue lines are the errors using the T average over past 12h. Even this rough study is remarkable evidence that we must use the average temperature over the past 12h when correcting QNH to get QFF. Besides the apparently obvious need for the temperature average, we also see that there are still large discrepancies with the AWOS data for SLP, even at the same average air temp, at the same locations. We can estimate the overall uncertainty in this approach as the spread of values about the blue line. 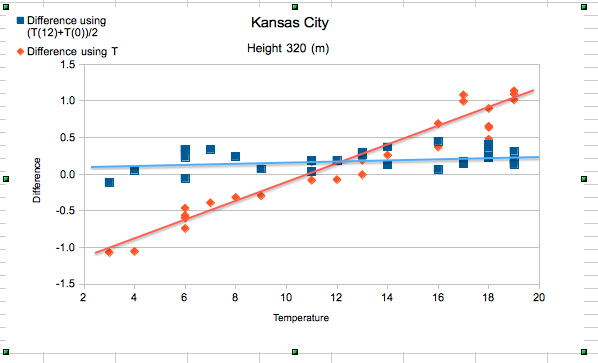 We see no evidence that the need for average is correlated with temperature, but the success of the solution does vary with elevation, which is not a surprise. This method works pretty well for stations below 2000 ft or so (< 1 mb) but for the very high stations we are still hovering around ± about 1 mb or so. All and all not bad, but a seemingly large scatter. The summary is, if you want to compare your pressure with what would be expected at sea level, you must take the recent history of the air temperature into account, and the higher you are, the more important it is. We are in the process of automating the data collection and analysis in hopes of learning more of the inherent reliability of such conversions to SLP as well as an attempt to develop some empirical modifications to table A2 to account for the discrepancies and scatter. We would like to end up with the blue line centered on 0.0 for all elevations, and to have a better feel for what variations about it are expected. We do have all of the dew point data, so a small correction for humidity can also be added, but the problem with that is end users will not have such data, so we want to learn how well we can do without it. A very special thanks to Albert Brown of Garfield HS in Seattle, who carried out the data searches and analysis. Why Study Celestial Navigation in the Age of GPS? If you rely solely on GPS to cross an ocean, you will not know if you are right until the last day. With that said, the real answer to the question is: You have a good chance these days of getting by without celestial navigation. ...In fact, you don't even need a boat to get to Hawaii or Bermuda, or to take a trip around the world. You can do this by plane. It is faster, cheaper, and more comfortable, and it will increase your likelihood of not needing celestial navigation as well. On the other hand, if you do choose a life on a small boat at sea, then one of the fundamental rules that has been proven so many times we don't have to go over it is you must be prepared to take care of yourself in any contingency. You must be self reliant. Murphy's Law was invented on a small boat at sea. Anything electrical is vulnerable after some time in the salt air, especially when it is being jarred, bumped, banged, and dropped (i.e. going to weather). To be self reliant, we need some dependable means of navigation, and celestial is that. Needless to say, a hand-held GPS and spare batteries stuffed into a well protected vacuum sealed bag is a pretty good back up these days, but it is not at all bullet proof. Batteries of any kind are not bullet proof. One could even argue that the durability of hand held GPS units is not improving at all with time. They are getting cheaper, and have more functions, but no evidence of more dependable. Furthermore, you are still dependent on the availability of the signals. In any sort of worldwide military conflict, it is likely you would lose these first thing. (Here is a March, 2016 example of US military shutting it off over hundreds of miles.) In principle, you could lose the signals in a union dispute. It doesn't really matter. Or lose them as a result of a "pre-commissioning validation exercise!" See also question 724 of the USCG Deck License exam questions on GPS. Keep in mind as well that GPS has always been notoriously easy to jam either maliciously or accidentally, so you could get stuck one day without it. Here is an example from 2011, and here shows our progress as of 2013. Google GPS jamming for more discussion. See also this note from Feb 2014: GPS pioneer warns on network’s security. And here is a database started in 2015 of GPS jamming events. But quite beyond the numerical likelihood of not having it when you need it, still a very small probability, learning celestial is still a most rewarding venture. It will make you a better navigator even on inland and coastal waters—you must, for example learn how to do a running fix to do celestial, and this could well pay off if you lost the GPS for some reason, and were left with just one light shining through the fog; or you are close in on a coast, but can then only identify one feature on the land (which is not a radar target), etc. Such problems are easily solved with a running fix. In some areas of the world you can have precise GPS coordinates, but no chart scale adequate to navigate on with Lat and Lon. You have to use basic piloting skills. This is not celestial navigation itself, but the question is, if you choose to not learn celestial because of GPS for worldwide navigation, what else are you prepared to not learn? But back to the celestial. Once you learn celestial, it is a trivial matter then to check your compass with the bearing to some celestial body, even well away from any land marks and in a strong unknown current. You can't do this with GPS in a dependable manner (in current and leeway), nor any other instrumentation on board, no matter what it cost, and no matter if you are a ship or a sailboat. The only way to truly check your compass at sea is with celestial. And if the boom hits your compass or lightning strikes near by, or–much more likely–you simply realize that it never was checked before, then this is something you will eventually have to do. In the last 4 or 5 ocean crossings I took part in, we did maybe take a sight or two for practice but we did not feel compelled to do celestial for basic navigation, and it was not needed. But, we did use cel nav on each of these voyages to check the compass. Ironically, the more technical the vessels become, the more this need arises. That is, we now have multiple compasses on board with heading sensors for the other electronics, and inevitably they will not agree, and if this does not get sorted out before leaving the dock, you are left to do it underway. And finally, there is a wonderful intellectual satisfaction that comes from learning and practicing celestial navigation. It is a way to see science and math come together in our own hands and mind and do something both tangible and useful. Learning celestial will make you a better ocean mariner because whether you show it or not, you will be anxious about your navigation if you are depending on something that we (most of us) cannot hope to understand. GPS is the quintessential black box. With nothing else to check it with, you can just hope and pray that it works right, and, again, you will only really know that on the last day, when you either see the right land or do not. And when you are anxious, you are more likely to make a mistake.... and you risk the chance of exposing your anxiety to the crew, which could undermine your leadership, which in turn could lead to all sorts of unpleasantness. None of that will happen of course so long as everything is going fine, but if things start to get stressed for any reason (bad weather, broken gear), this factor will just add to the challenge. In the long run, it is best to learn celestial, even if you are never going to use it. You will know you can use it if you need to, and that alone will make it worthwhile. If you plan to crew on other vessels, then knowing celestial will be an important part of your credentials and will certainly help you find a good position. The majority of skippers will believe they do not need it, but they will be happy to know someone on board does know it. In contrast to GPS, celestial navigation is completely transparent. If you are confident that your watch is right, then you must be located at the intersection of the 3 star lines you have plotted. There is no mistake you can make and still get that confirmation. Likewise, if you make a mistake, it will generally stand out like a sore thumb and you can go back over your work and find the error. With celestial navigation, you are crossing an ocean with the same confidence you would be sailing from headland to headland on inland waters. Think of it as sky piloting. And one last related thought: GPS is (in an abstract sense) another version of SatNav (the Navy Transit System, now long gone) that happens to be a lot easier to use and is more accurate. But in this sense, we have had all-weather global satellite positioning for more than 30 years now. Yet there never was any consideration at all by the USCG to remove the requirement of learning celestial from an ocean license exam. And there is none now. To get a USCG license that is valid offshore you need to know celestial and pass a test on it. Whatever the reasoning behind that decision for ships, it is many-fold increased for small boats at sea. Still a required part of professional training.